6:00 PM Vespers (4:00 PM October through April). St Basil Church was established in September 1904 by a group of immigrants from Central and Eastern Europe. Simpson was chosen as the site for a new church building for its central location to Carbondale and the Upper Valley of Northeastern Pennsylvania. The parish was started in 1903 under the leadership of Rev. Arseny Chahovtzoff (The Late Archbishop Arseny), who was also the pastor of St. John’s Russian Orthodox Church in Mayfield. The St. Basil’s Society, formed in the same year, was very instrumental in the building up of the community of St. Basil in Simpson. Hard labor, that still exists in the parish today, was the contributing factor in the establishment of the original church community. A building committee was established in 1904 as a result of the growing number of Russian people settling in Simpson. The original members of the building committee included John Babich, Matthew Garbera, Alexis Hitchko, Victor Koropchak, Kondrat Merena, Peter Schlachta, and Timothy Sucheniak. A location that was known as the “Old Ballfield” was purchased as land for the church. The original church building was dedicated on January 27, 1905 by Archbishop Tikhon (later Patriarch of Russia, and now St Tikhon, Patriarch of Moscow). The first priest assigned to St. Basil Church was Rev. Alexis Bohovlsousky, who was assigned to alternate services between St. Nicholas, Olyphant and St. Basil. Since July 1991, Fr. Leo Poore has served as the priest at St. Basil. Many temporary and permanent pastors have served the faithful of St. Basil and contributed to the progress of the parish. We have also been afforded the opportunity to work with many of the seminarians from St. Tikhon’s Seminary. This has brought about a learning experience for both the parish and the seminarians, which has also contributed to the inner growth of the parish. The first Baptism of the parish was that of Andrew Tokarchick, son of Constantine and Mary Tokarchick, on May 15, 1905, and the first Marriage of the parish was for Peter Smetana and Christine Labowsky on July 2, 1905. The first President of the parish was Kondrat Merena, the first Treasurer was John Babich, the Assistant Treasurer was Pantalemon Tarris, (grandfather of Jerry Tarris, the current Vice-President of the parish council). The presiding priest was the Secretary. The first parish meeting was held on January 14, 1907. The offices held by members included: President, Vice-President, Treasurer, Secretary, Sexton, Bell Ringers, which included John Mikulak, (father of our oldest parishioner, Michael J. Mikulak), Gravedigger, Collectors, Auditors, and School Sexton. The Protection of the Theotokos Beneficial Society that was chartered in 1911 still remains in existence today. The Sisterhood holds their Annual Cookie Sale, Hoagie Sale, and is responsible for making the Annual Chicken Barbeque a success. All the money raised through these events is used for purchasing items needed for the church, continuing the original goals of the first Sisterhood. Many organizations were formed that would work toward the building up of the church. One of the most important was the founding of the John Naumovich Russian Orthodox Society, whose sole purpose was teaching the Russian Orthodox Faith. Church School Classes were held daily from 4-6 PM and Saturdays from 9-11 am, and 2-4 PM. In 1937, the church was extensively damaged by fire. 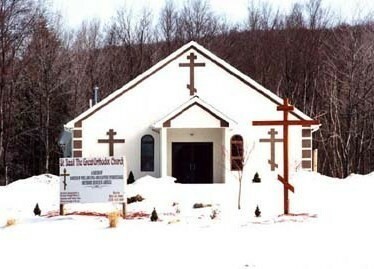 The plans and specifications for the new church were completed by Vladimir Koropchak and the new church was started by the Holt Lumber Company. On July 10, 1937, the artistic painting of the iconostas, main altar, and side altar were started by artist Michael Kupetz. Some of the icons that Michael painted were donated to St. Basil’s and are presently hung on the walls in our church. The new church was dedicated on September 6, 1937 by Archbishop Adam. Many changes have taken place in the past 100 years. Those changes have brought about an opportunity for growth. We embraced this opportunity and began another chapter in life of St. Basil’s parish. After many years of worshipping at the Grattan Singer Social Hall, our hope was soon becoming a reality. Through many years of prayer and searching, a piece of land on 9 Lord Avenue, Simpson was chosen as the “perfect” location for a new church. Once used as a ballfield, the land was purchased in November 1998. Before the building process began, a groundbreaking service was held on May 1, 1999. The service was celebrated by His Eminence, Archbishop HERMAN, Fr. Leo Poore, Pastor of St. Basil’s, members of the Diocesan Clergy, and sons of the parish, which included Fr. Eugene Tarris, Fr. Daniel Pavelchak, Fr. John Chupeck, and Fr. Joseph Gallick. The groundbreaking included the carrying of a cross that was planted on the section of the land where the altar was to be constructed. It was carved by Michael J. Mikulak and his nephew, Peter Getzie. The cross was made from a rare piece of native Douglas Fir from the state of Washington. After the groundbreaking, a building committee was formed to develop plans for a new church. Ronald Franks Builders was chosen as the contractor for the new church. Construction of the new church building began in July 2000. Under the direction of Stephen Kowalsky, members of the parish volunteered their time to install the heating system. (The heating system in the original St. Basil Church was purchased for $13.80.) The carpeting was installed by James Thomashefsky, a member of St. Nicholas Church in Olyphant, PA.
On September 9, 2000,the first service in the new church was celebrated, as Benjamin David Roat, son of David and Daria (Proch) Roat (and great-great grandson of Harry Kutch, one of the founding members of St. Basil’s) was baptized. On October 1, 2000, the Feastday of the Protection of the Theotokos, the first Divine Liturgy was served. Fr Leo Poore celebrated the Divine Liturgy assisted by Dn. James Weremedic, and Altar Boys Christopher Getzie and James Weremedic. A celebration was held at the Grattan Singer Social Hall. On Saturday, September 15, 2001, the parishioners of St. Basil’s celebrated the blessing of their new church. The day began with the greeting of His Eminence, Archbishop HERMAN by Fr. Leo Poore, Michael Mikulak (the oldest member of the parish), Julia Mazza (president of the Sisterhood), and Alexandra Roat (youngest female member of the parish). The Divine Liturgy was celebrated by members of the Diocesan Clergy and former priests of the parish, which included Fr. Daniel Geeza, Fr. Michael Lepa, Fr. Michael Evans, Fr. David Shewczyk, and Fr. Joseph Irvin. For the parish, it was a culmination of many years of carrying boxes on a weekly basis, to set up a temporary church. Even though the road was rocky at times, just like the driveway to the church, the parish realized that by having a building of their own, life on a weekly basis would be a little smoother. During the last few years, the parish has hosted the Deanery Mission Service, the Advent Lecture, sponsored by the Wilkes-Barre Deanery, as well as our Annual Lenten Service with the faithful from St. Nicholas, Olyphant. May we always remember the dedication and vision of the founders of St. Basil Church. It was their dedication and vision that provided us a foundation for our lives at St. Basil’s. May we always be thankful for the blessings that God bestowed upon us. Hopefully with God’s blessings, we will continue to grow spiritually and numerically so that future generations will be able to celebrate the 200th anniversary of the parish.